Imagine something new and unknown, a hot glass experience where you create glass pieces with your friends, family, or co-workers. We have the perfect Extreme Party Package Deal to fit your one of a kind party in a sizzling style. Here at Vetro we share a creative party atmosphere where you can discover a perfect venue for your creative minds. It’s the perfect venue for birthdays, family outings, anniversaries, and even wedding events. No more boring back yard BBQ’s! This Party is fun & exciting! Reserve your hot glass entertainment today! Your Extreme Party kicks off with the Glassblowers creating a hand-blown piece to show the overall process of glassblowing and how our team “parties” together. Next each participant will create their very own glass pieces. Each attendee will choose from a selection of several colors for their glass artwork. The glassblowers assisting them will get the first gather of glass. The participant will be able to apply their chosen colors and help reheat the artwork. The participant will be able to swirl and twist their colors until they are happy with their design. The participant will reheat the artwork in the furnace. The last gather of glass and final shaping will be done by the glassblower. Finally the “Bubble Blowing Contest” your group will choose two of the party goers, we will then give each participant a blowpipe with a gather of molten glass on the end and see who can blow the largest bubble. Vetro will not be able to book or secure your time slot for your event without a $600.00 deposit or a $1500 deposit for after hour events. Cancellation policy: Cancellation of your event must be made 14 days prior for a full refund – $200 will be withheld from the refund if your event is not canceled within this time frame. No refund will be given if notice of cancellation occurs within 24 business hours of your events start time. All glass artwork will take 48 hours to cool down. Shipping is not included in the above pricing. Each piece of artwork will be individually wrapped or boxed and labeled with each participant’s name. Bleacher seating is available for your party to relax on. During your Extreme Party Event you may have your event catered – Vetro does not provide or coordinate catering. You are more than welcome to inquire about caterers that Vetro recommends by calling our Gallery anytime at 817-251-1668. Adult beverages are allowed but you must be 21 years of age or older to drink – we will check ID’s and we encourage you to always drink responsibly. Gratuity is appreciated for the gallery and studio staff but is not expected. Once your Art Glass choice style and facility option has been chosen we can create the finalized contract. Our Team looks forward to working with your Party. Let’s create something beautiful together! Please make sure to bring your camera and capture your molten glass memories! 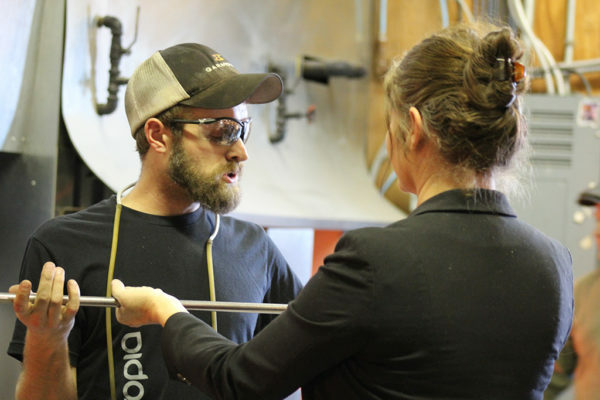 Personal Help Create Events can be an exciting and unique opportunity to try your hand at a new medium and is the perfect introduction into glass blowing. No experience is necessary. During your Personal Help Create event you will be introduced to new techniques including choosing the color and applying it to molten glass, and choice of design, re-heating the molten glass, and centering the molten glass on the blow pipe. You will work on your piece one-on-one with the artist. 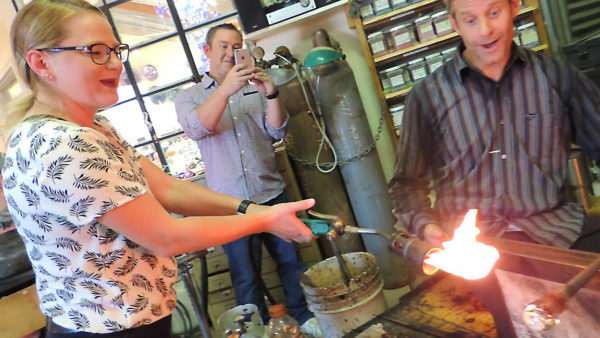 This hands-on experience will leave you with a new appreciation for glass. You will gain a sense of accomplishment after having an extraordinary day, learning new skills, and making your own unique pieces. Each participant will help create their own artwork with molten glass. Each attendee will choose 2-3 colors from a selection of several colors for their glass artwork. The glassblowers assisting them will get the first gather of glass. The participant will be able to apply their chosen colors and help reheat the artwork. The last gather of glass and final shaping will be done by the glassblower. Vetro will not be able to book and or schedule your event without a 50% down deposit. All glass artwork will take 48 hours to cool down, grind and polish. Help Create packages are offered Tuesday – Saturday 10 a.m. to 6 p.m. September – April and Tuesday – Saturday 10:00 a.m. to 5 p.m. May – August. Please call the Gallery at 817-251-1668 to check availability. Once your Art Glass choice style has been chosen we can create the finalized contract. Our Team looks forward to working with your Party. Let’s create something beautiful together! Please make sure to bring your camera and capture your molten glass memories!